What if…..you could…..pack a reversible dress? When I first thought about this in a moment of epiphany (kind of), I pictured that the overlap of reversible and dress probably wouldn’t really yield any cute options. In the world of reversible clothing, turns out there are a ton of adorable dresses out there! Check out what I found. A reversible black-to-white day-to-night dress by Elie Tahari. This would be perfect for a business trip! A super simple option is this dress. It’s on sale for $35 and could easily be styled in so many different ways. This dress would be the perfect addition to the Europe trip capsule wardrobe I put together a while back. Dresses with sleeves are another one of my packing favorites – simply because they’re an entire outfit in one. This reversible dress has sleeves and could easily be worn to almost any ocassion. For a sleeveless option, check out this simple dress. I love the ruching and I think it could be worn as a sundress for the daytime, but also styled with heels and jewelry for evenings out. This dress is a different style of reversible – instead of switching it inside-out, it can be worn with either the front or back in front. If that makes sense. You might want to add a layer underneath though, unless you’re channeling J Lo, which is totally understandable. 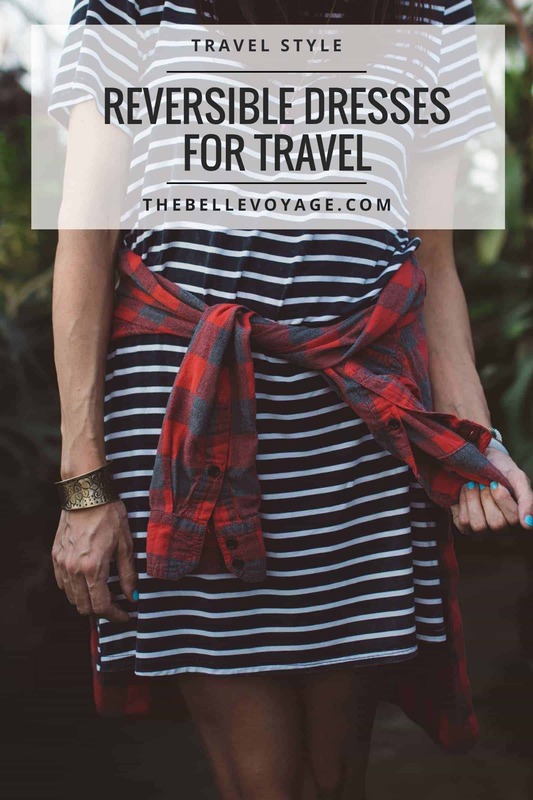 I’ll be featuring more reversible clothing and accessories that are perfect for travel in the coming months, so stay tuned!